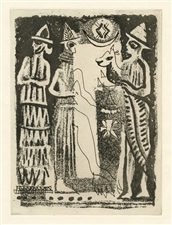 John Piper original aquatint "Figures from a Seal"
Medium: original etching and aquatint. Published in 1955 by Curt Valentin. A good impression on wove paper, the plate measures 8 1/4 x 6 1/8 inches (212 x 156 mm). Not signed. John Piper original lithograph "Niton, Isle of Wight"
Medium: original lithograph. Published in 1955 by Curt Valentin. The total sheet measures 9 1/2 x 12 1/4 inches. Not signed.